The journey started long ago as a youth in 1996, learning to play music growing up in the neighborhoods of southern California. With so much to learn, see, live and experience under the sun, Its no wonder that the sound pouring through the speakers feels like a warm, sunny California day. Like many artists on the musical journey, Skunkdub has a history full of bands and projects (Inhale, Secret Trees, Natural Heights, StrangerBand) that have helped pave the way to the road he walks today. The creative processes, the influence from a variety of music genres (Rock, Soul, Reggae, Hiphop, funk, R&B, Blues, Ska) and the culture clash of various SoCal lifestyles. All of it, the intoxicating relationships, the everyday struggles with a nine to five, Corrupt government systems and officials, failing educational school systems, and media infused propganda blasting from the radios and televisions sets. All of life’s ups and downs, have helped pave the way to his life long continuous musical journey. As a performing artist Skunkdub always brings Love and Good Vibes to every show, and rocking the stage with lots of energy in every performance. With a distinct writing style both lyrically and musically. Skunk seemlessly incorporating up beat melodic grooves and riddims in his songs about the life he lives. Life, love, memories and experiances through music. Skunkdub seeks new light, love, and unity as an artist and as a man who looks forward toward a better tomorrow through music. 2014 and 2015 have been huge for Skunkdub and his band. Over the course of a year and a half, the reggae artist performed over 300+ live shows. Spreading out from Local shows to full nationwide tour dates.The High Fyah Tour 2014, covered 70 cities, 14 states and over 42,000 miles. Which included a one Month run to the East Coast with Stranger band from San Diego. Skunk and his crew were the backing band for stranger, as well as the opening act on the one month, cross country tour “Come Together 2014” . 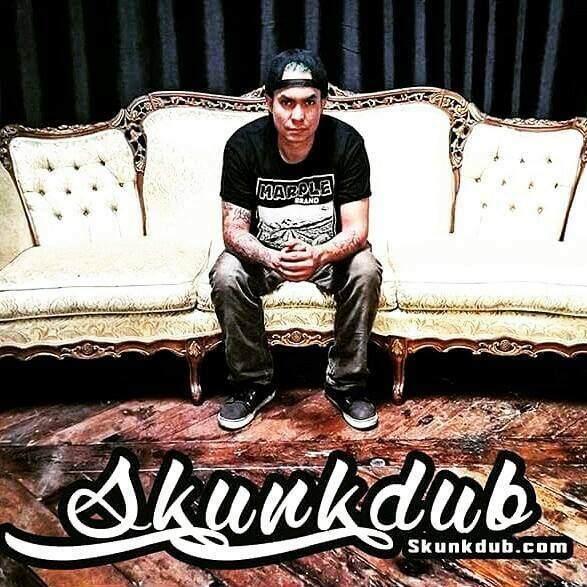 Skunkdub released his debut Ep, the “Royale Ep” digitally on select media outlets, and hard copies in summer of 2014. It is just another day in a bright future, beginning with the new full length album “Royale With Cheese” released in September and Set to drop digitally through AcropolisRpm in Late November.